This means it will let you run apps that require root access. It may not necessarily allow flashing of custom ROMs or deleting preinstalled apps. You can find more about rooting here: Rooting Explained + Top 5 Benefits Of Rooting Your Android Phone and custom ROMs here: Custom ROMs For Android Explained And Why You Want Them. To see if this method works on your phone, check the list below or simply try it out - if it doesn't work, nothing bad should happen (though don't blame us if your phone explodes). Pick which version of Android your device is running and click the Root or UnRoot buttons. 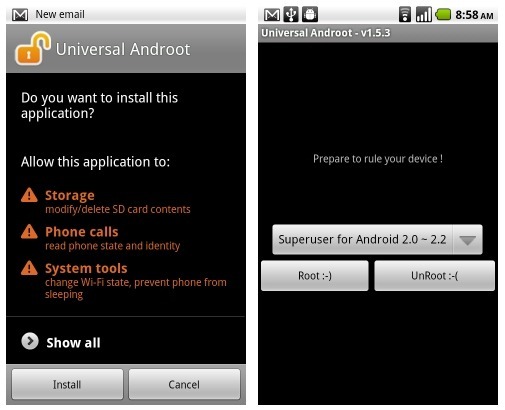 If you have already rooted your device via bootloader unlock, the UnRoot function will not re-lock your bootloader or unroot your device. Find and install it with your file browser of choice (I choose Android Mate in the market, or you can use Astro). Don't forget that this ability is only enabled if you check the Settings > Applications > Unknown sources option. If you experience problems, hit up the xda forum post and post your question there. Note: this is a guest post by Jason Rossicoe, one of Android Police job applicants, edited by Artem.